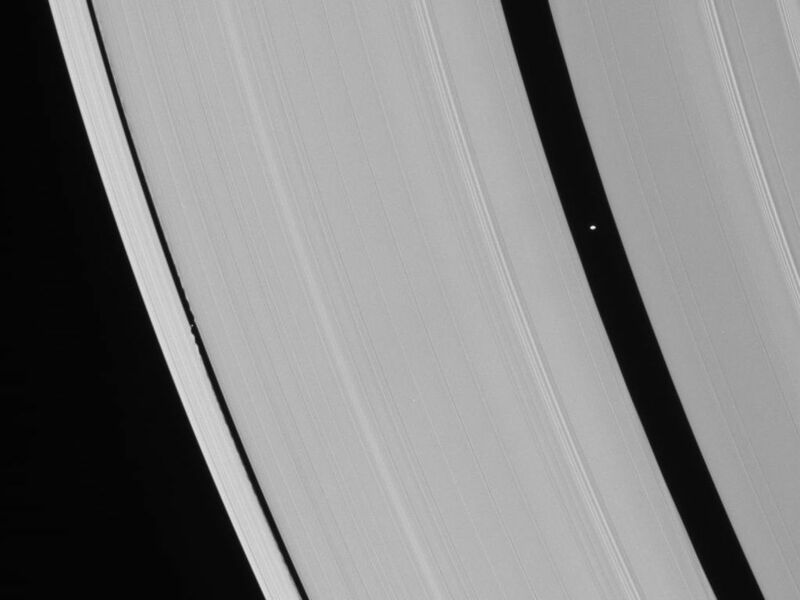 Saturn's ring-embedded moons, Pan and Daphnis, are captured in a single Cassini spacecraft narrow-angle frame in an alignment they repeat with the regularity of a precise cosmic clock. Pan is closer to Saturn, and thus orbits faster, and Pan overtakes Daphnis every 19 days. The flying-saucer-like shape of Pan (26 kilometers, or 16 miles across) can easily be discerned here. Daphnis (7 kilometers, or 4.3 miles across) is a mere speck, although its presence is made obvious by the edge waves it creates in the surrounding ring material. Pan also raises waves in the edges of the Encke Gap (see PIA06099). 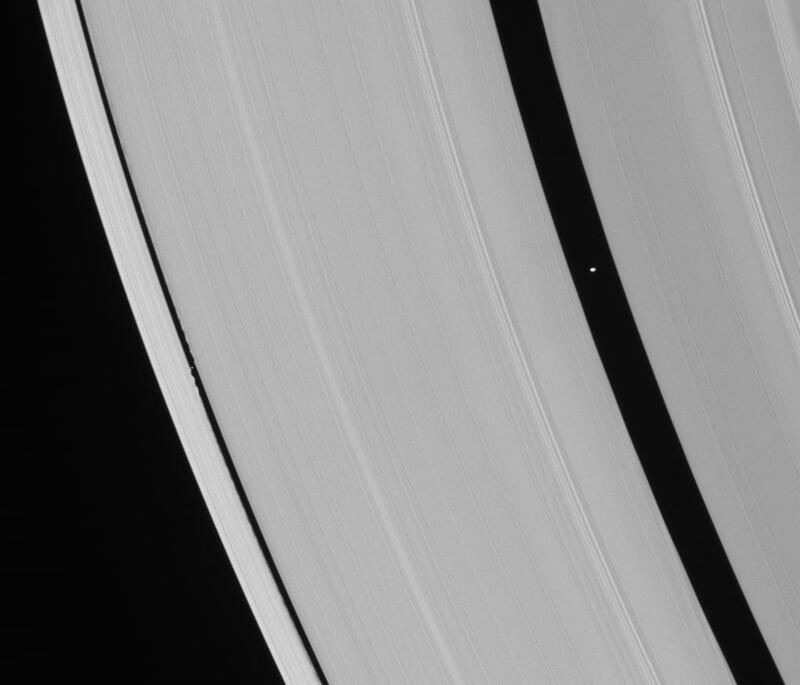 However, even though Pan is more massive than Daphnis, Pan is farther from the edges of its gap than the smaller moon. This causes Pan's edge waves to have a much longer wavelength (they are more stretched out) and a smaller amplitude (they do not extend as far inward from the gap edge) as those created by Daphnis, making them more difficult to see. This view looks toward the sunlit side of the rings from about 24 degrees below the ringplane. The image was taken in visible light with the Cassini spacecraft narrow-angle camera on March 24, 2007 at a distance of approximately 889,000 kilometers (553,000 miles) from Daphnis and at a Sun-Daphnis-spacecraft, or phase, angle of 21 degrees. Image scale is 5 kilometers (3 miles) per pixel.